I can be too verbose with some of my posts. This will be quick. Told you it’d be brief. Go. Now. Read. Why isn’t Software Testing Performed as Efficiently and Effecively as it could be? Please consider taking Fernández’s short survey. It takes only 5-10 minutes to complete. How, with a minimum of effort, can you discover what does what to what? Which factors do what to which responses? The experimenter who believes that only one factor at a time should be varied, is amply provided for by using a factorial experiment. Only in exceptional circumstances do you need or should you attempt to answer all the questions with one experiment. Where the quotes are not attributed, I’m assuming the quote is from one of the authors. The most well known of the quotes not attributed, above, “All models are wrong; some models are useful.” is widely attributed to George Box in particular, which is accurate. Although I forgot to confirm that suspicion with him when I saw him over Christmas break, I suspect most of them are from George (as opposed to from Stu or my dad); George is 90 now and still off-the-charts smart, funny, and is probably the best story teller I’ve met in my life. If he were younger and on Twitter, he’d be one of those guys who churned out highly retweetable chestnuts again and again. As you know if you’ve read my blog before, I am a strong proponent of using the Design of Experiments principles laid out in this book and applying them in field of software testing to improve the efficiency and effectiveness of software test case design (e.g., by using pairwise software testing, orthogonal array software testing, and/or combinatorial software testing techniques). In fact, I decided to create my company’s test case generating tool, called Hexawise, after using Design of Experiments-based test design methods during my time at Accenture in a couple dozen projects and measuring dramatic improvements in tester productivity (as well as dramatic reductions in the amount of time it took to identify and document test cases). We saw these improvements in every single pilot project when we used these methods to identify tests. How long did it take to create the pairwise / DoE-based test cases? How many defects were found per hour by the tester(s) who executed the “business as usual” test cases? How many defects were found per hour by the tester who executed the pairwise / DoE-based tests? How many defects were identified overall by each plan’s tests? I would be thrilled if this blog post gave you the motivation to explore this testing approach and measure the results. Whether you’ve used similar-sounding techniques before or never heard of DoE-based software testing methods before, whether you’re a software testing newbie or a grizzled veteran, I suspect the experience of running a structured proof of concept pilot (and seeing the dramatic benefits I’m confident you’ll see) could be a watershed moment in your testing career. Try it! If you’re interested in conducting a pilot, I’d be happy to help get you started and if you’d be willing to share the results of your pilot publicly, I’d be able to provide ongoing advice and test plan review. Send me an email or leave a comment. I’d welcome your comments and questions. If you’re feeling, “Sounds too good to be true, but heck, I can secure a tester for half a day to run some of these DoE-based / pairwise tests and gather some data to see whether or not it leads to a step-change improvement in efficiency and effectiveness of our testing” and you’re wondering how you’d get started, I’d be happy to help you out and do so at no cost to you. All I’d ask is that you share your findings with the world (e.g., in your blog or let me use your data as the firms did with their findings in the “Combinatorial Software Testing” article below). Related: (My brother’s blog: he’s in IT too and is also a strong proponent of using Design of Experiments-based software test design methods to improve software testing efficiency and effectiveness). I responded to a recent blog post written by Gareth Bowles today and was struck – again – that a defect that must have been seen >10 million times by now has still not been corrected. When anyone responds to a blog post on Blogger.com, the stat counter says “1 comments” instead of correctly stating “1 comment.” What’s up with that? For Blogger.com to leave the extra “s” in has me stumped for several reasons. First, this defect has been seen by a ton of people as Blogger.com is, according to Alexa’s site tracking, the world’s 7th most popular site. Second, Blogger.com is owned by Google (among the most competent, quality-oriented IT wizards on the planet) and no trademark protection is preventing the correction. Third, it would seem to be such an easy thing to fix. 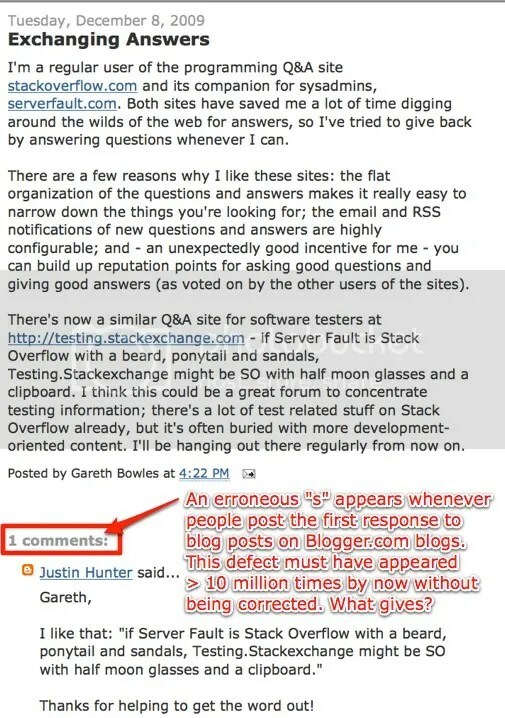 Fourth, other sites (like wordpress) don’t make the same mistake. Fifth, it doesn’t seem like a “style preference” issue (like spelling traveled with one “L” or two); it seems to me like a pretty clear case of a mistake. It would be a mistake to say “one cars,” “one computers,” or “one pedantic grammarians”; similarly, it is a mistake to say “one comments”. What gives? Anyone have any ideas? For anyone wondering where the “>10 million times” figure came from, it is pure conjecture on my part. If anyone has a reasoned way to refute or confirm it or propose a better estimate, I’m all ears.